Recently extended during a major refit lasting over 18 months, the 91.5 metre Queen Miri we see on the water today is vastly different than the 85-metre superyacht Delma as which she entered the refit shed in Genoa, Italy last year. Built in 2004 by Greek shipbuilder Neorion, life for the yacht started out as the Annalise, and was renamed, Delma, in 2007 after being sold to a new owner. Today, Queen Miri is finished with a range of new features including a new exterior profile, re-styled by the hand of Dutch studio, Bernd Weel Design. A new 16-metre hull section was replaced and now accommodates a floodable garage at her stern area as well as two new MTU M93L engines. Her interior is said to have undergone drastic changes as well, and was redesigned by the Italian Design company, Studio Massari. 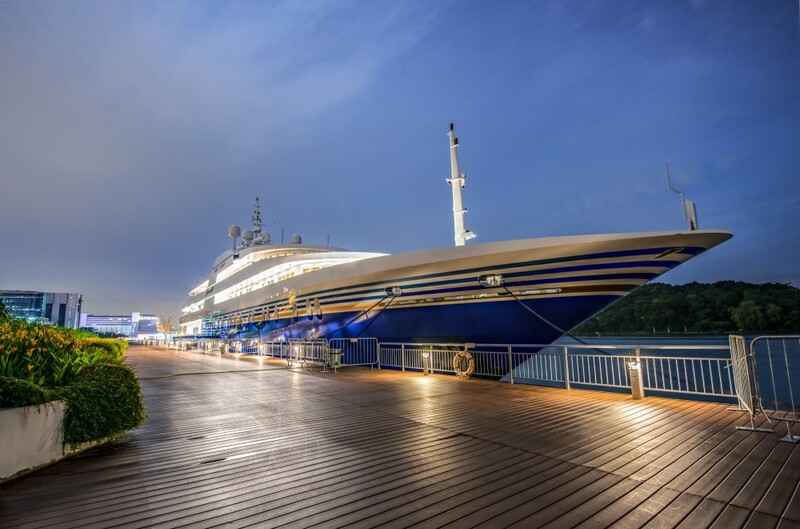 After a busy summer’s cruising season, Queen Miri has headed east and is seen here in the Keppel Bay Marina, Singapore.